To book, we only require a per-person deposit, which you can pay with your credit card or PayPal account. This deposit will be applied towards the cost of your package, and is generally non-refundable. The balance is due 120 days prior to departure (or within 72 hours, if you're booking less than 120 days prior to departure), and can be paid by credit card, PayPal, check or money order. $400 – $650 Instant Savings. Expires May 16, 2019. * All prices reflect savings. What to Expect This fast-paced, escorted educational program includes a significant amount of walking or hiking, sometimes on uneven terrain and slippery terrain with the caves in Viñales, requiring a high level of physical fitness to fully enjoy the trip. 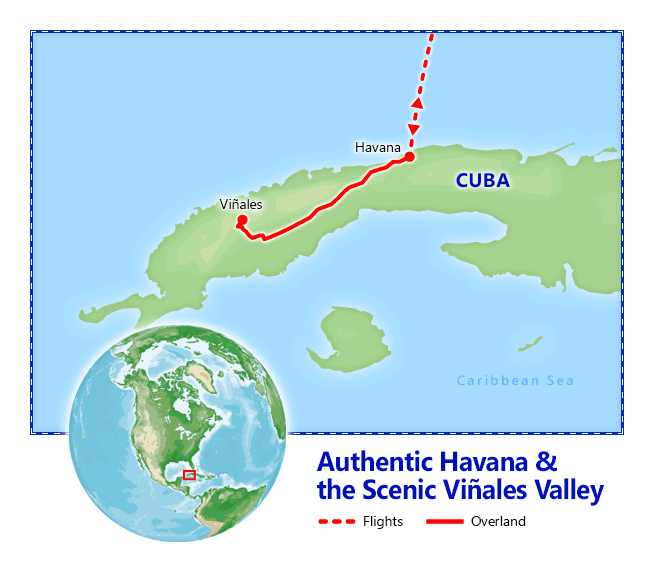 Our comprehensive western Cuba tour, Authentic Havana & the Scenic Viñales Valley, takes you right into the heart and soul of Cuba! Start your immersive experience in Havana where you'll marvel at the city's unique blend of baroque and neoclassical architecture. Stay four nights in a casa particular and taste the flavors of Cuba as you enjoy included meals in privately-owned restaurants called paladares. Walk in the footsteps of Ernest Hemingway at his famous home Finca Vigia, watch the masters roll cigars, and so much more! Then spend two days exploring the stunning views and breathtaking panoramas of the Viñales Valley as you learn about the multi-ethnic communities there that have passed down traditional agricultural techniques for generations. Visit a scenic horse farm, La Guabina, to learn about their stunning Cuban breeds. Go beneath the surface at the Indio Cave and stand in awe of the geological structures and underground pools. Stop for sunset views of the verdant valley below for a moment you won't forget. With included flights, fully guided and legal People-to-People touring, high-quality accommodations and a fully inclusive itinerary - you don't want to miss this chance to take a step inside the daily life of the Cuban people. But hurry and book, because space is limited! We're still going to Cuba! Our People-to-People tours are still legal and not impacted by recent changes in U.S. policy. Questions? 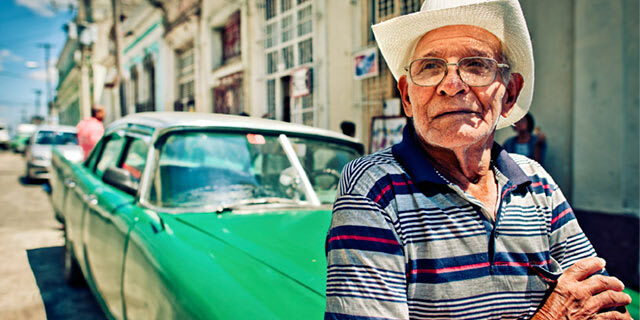 See our Cuba FAQs. Instant Savings: Get $400 – $650 off if you book by May 16, 2019! Unfortunately, we don't offer late returns on this package. However, if you select the Land Only option, you're welcome to make your own arrangements to arrive early or stay later. Want to extend your trip? 1. There is limited inventory of more spacious rooms with a king size bed for an additional $80 per person sharing double occupancy. Please call us to request availability. 1. Baggage fees must be paid at airport for each flight: $25 for 1st checked bag / $40 for 2nd checked bag. 1. For flights from MIA, upgrades may be available to First Class starting from $250. For actual prices and availability from this or other cities, please make your request during the reservation process so that our air team can check the availability and provide you with the exact rate for your chosen travel date. Rates and space are subject to availability with the airline, an increased deposit may be required to confirm a seating upgrade. Accommodations: 3 nights El Encanto de Perseverancia, Havana. Included meals: Dinner. Full Day Itinerary: Today, board your flight bound for Havana, Cuba's capital city and designated World Heritage Site by UNESCO in 1982. ¡Bienvenidos a La Habana! You are welcomed by a representative holding a Friendly Planet sign outside the arrivals terminal at the Havana Airport. Board your air-conditioned vehicle and transfer to the casa. Check into the casa and enjoy a welcome drink. You’ll meet your tour manager and have some time to rest a little or take a stroll to the nearby Malecon before dinner. This evening, enjoy a welcome dinner at a local paladar. Full Day Itinerary: After breakfast this morning, experience the Cuban collection at the Fine Arts Museum. Here you can appreciate the evolution of the country's history through the work of its most famous artists. 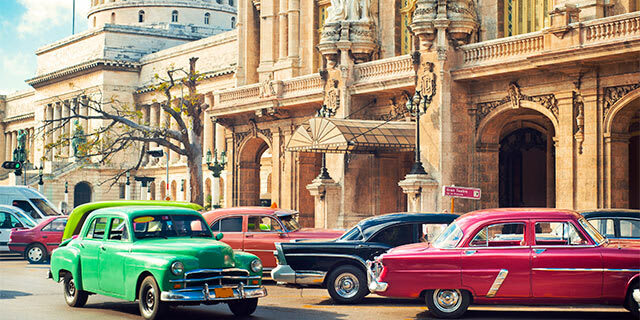 Enjoy a leisurely orientation walk in Old Havana with your guide through the vibrant cobblestone streets as you immerse yourself in the colors of Cuba which surround you. Explore the Used Booksellers' Market, a cross-cultural treasure trove for readers of every genre. Meet local independent booksellers and engage in friendly conversation with Cuban readers about popular Cuban and American literature. Visit the private studio of one of Cuba's talented independent artists. During your visit, you'll learn different techniques of printmaking, sculpture and other art forms from innovative Cuban artists and their teams. Enjoy lunch at a local paladar. After lunch, visit a local ration store. Your Cuban host will explain the system of rationing and the two-currency system as well as the difference between Ration Stores, Cuban Peso Stores, and CUC stores. Then, experience a private cigar rolling demonstration to witness firsthand how the famous Cuban cigars are each individually hand-rolled. Afterwards, enjoy what the Cubans fondly refer to as a marriage, where you’ll have the opportunity to sample the three Cuban pleasures - rum, coffee and a Cuban cigar. Return to the casa and enjoy the rest of the day on your own. We recommend dining at a paladar for dinner. Feel free to choose one from the list we provide or ask your guide or tour manager for recommendations. Full Day Itinerary: After breakfast this morning, transfer to the ferry terminal for a short ferry ride to the other side of the bay. Visit Regla, a settlement south of the bay, and the famous Virgin of Regla Church, where you’ll experience an interesting blend of Afrocuban creeds and the Catholic faith. Continue to the district of Alamar on the outskirts of Havana. Started as an expansive social housing project in the 1970's, these Soviet-style, pre-fabricated concrete apartment blocks are now home to roughly a hundred thousand Cubans. Among the buildings in Alamar are community gardens, called "Organopónicos," where residents grow fruit, vegetables and herbs for their own consumption and for local sale. Similar to co-ops and community gardens in the United States, these Organopónicos facilitate community development and offer Alamar's residents access to fresh produce. Enjoy a visit to one of these Organopónicos, which few visitors to Cuba have the opportunity to do. You'll continue to the quaint fishing village of Cojimar, the setting for Hemingway's book, The Old Man and the Sea, and enjoy lunch at a local paladar. La Terraza Restaurant, where the book's character Santiago brings in the remains of his epic fish, still stands today, and the pier where Hemingway's fishing boat docked can be seen from the shore. Drive to Hemingway's Cuba retreat. There are many historical and cultural ties between Cuba and the United States, and one of the best known is the legacy of Ernest Hemingway, who lived more than 20 years in Cuba, from 1939 to 1960. You'll visit Hemingway's beautiful mansion, Finca Vigía, (literally meaning "lookout farm"), now a museum. While visitors cannot enter the house itself, the large, open windows and doors around the entire property allow plenty of unobstructed views of his preserved 9,000 book library, as well as his animal trophies and famous fishing boat, Pilar. Then, walk along the beautiful Paula Promenade by the waterfront to see the changes related to the program of transformation for the Bay of Havana. Stop at the Artisans' Market, where you will find plenty of souvenirs, including handicrafts, posters and other collectibles. Afterwards, return to the casa and enjoy the remainder of the day at leisure. Accommodations: 2 nights Hotel E Central, Viñales. Included meals: Breakfast, lunch & dinner. Drive to the beautiful horse farm, La Guabina. Enjoy an authentic lunch at La Guabina. Enjoy dinner at local paladar. Full Day Itinerary: After breakfast this morning, depart for Finca La Guabina, one of Cuba’s most exclusive horse farms in the Pinar del Río province. Tour the beautiful farm to learn about their work as a farm and cattle ranch, and most importantly, their specialization in breeding Cuban horses such as the Pinto Cubano and Appaloosa. Enjoy an authentic Cuban lunch at the Finca’s ranchón, a typical Cuban outdoor dining area. After lunch you’ll to learn more about life on the farm and have the opportunity to participate in horseback riding and watch an animal exhibition. Continue on to Viñales Valley with a brief stop at the viewpoint of the Jazmines to enjoy the beautiful view of the valley. Check in at your hotel for a short rest before dinner. Enjoy dinner at local paladar tonight with your fellow travelers. Full Day Itinerary: After breakfast this morning, explore the Indio Cave, or Cuevo del Indio, located on the banks of the San Vicente River. Take a boat ride through the cave and learn about the cave drawings from the first inhabitants of the land. Be sure to wear walking shoes or hiking boots for your journey into the caves to experience the stalagmites and stalactites, underground pools and other unique formations. Continue through the impressive landscape of this area and see how tobacco, cassava and taro are grown. Tour a tobacco farm and have the chance to meet rural Cuban families and see how they live and work. Enjoy lunch at a local farmhouse in the Valley. After lunch, discover more about Viñales on a tour with a specialist to learn about the history, culture and restoration work in the area. Visit a rural community project “Ventana al Valle”. Tonight, enjoy dinner at local paladar. Accommodations: 1 night El Encanto de Perseverancia, Havana. Included meals: Breakfast, lunch & dinner. 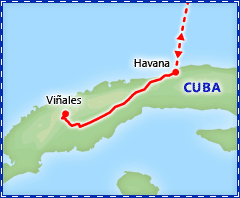 Full Day Itinerary: After breakfast this morning, depart for Havana. Visit the private home and art gallery of independent artist, Beatriz Santacana. Ms. Santacana’s works in ceramics, oils and sculpture are unique and exhibited in major cities throughout the world. Visit the community project, Clave Sol, a cultural initiative program dedicated to teaching children how to play musical instruments. If Clave Sol is unavailable, another interesting community project will be provided. Continue on to stop at the Plaza de la Revolución, the most famous and politically most important square in Cuba and a fine example of the modern movement of architecture in the 1950’s. The square has witnessed many rallies and revolutions, which have altered the course of Cuban history. Here you'll view the 109-m tall tower and 18-m statue of José Martí. Visit the famous Christopher Columbus Cemetery, a miniature city of mausoleums, crypts, family chapels, vaults, sculptures and ornate gravestones, which has been named a National Landmark. Continue on a panoramic tour of the urban area that lies west of Old Havana and shows the progression of the city over time: from a neighborhood along the city walls after its demolition, passing through the transitional Midtown (Centro Habana), to the extensive and more modern Vedado and Miramar neighborhoods. Stop at Bar la Fama at the Hotel Nacional de Cuba, one of Havana’s most iconic, historical properties and enjoy a cocktail at the bar or on their beautiful outdoor terrace. Tonight, join your fellow travelers at a farewell dinner, served in a privately owned restaurant. Be sure to wear your dancing shoes as you enjoy live, traditional Cuban music and salsa dancing, reminiscent of the Buena Vista Social Club. Full Day Itinerary: Today, bid farewell to Cuba as you transfer to Havana's Jose Marti International Airport and check in for your flight back to Miami. ¡Adiós, Cuba! Note: Itinerary sequence and visits are subject to change based on local availability. This itinerary provides a full time schedule of educational activities that will result in meaningful interactions between you and individuals in Cuba. U.S. law requires that all persons who participate in this program adhere to this full time schedule, and imposes on Friendly Planet the obligation to ensure such adherence. What should I know about Cuba? Check out our guide for travel tips, the best time to go, blog posts, videos, and more.